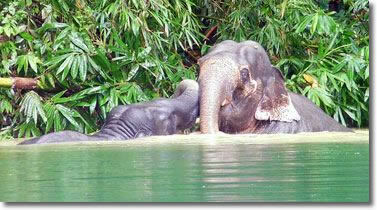 Our Khao Sok National Park lake expedition is aptly labeled as a soft adventure. The pace is very slow and easy as the main focus of this trip is spotting wildlife. 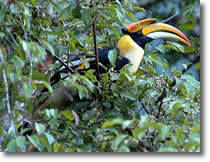 The birding in Khao Sok National Park is very good and the wildlife sightings are often astonishing. We visit the 165 square kilometer reservoir known as Cheow Lan Lake. The actual national park part of Khao Sok incorporates the reservoir and covers 446 square kilometers! 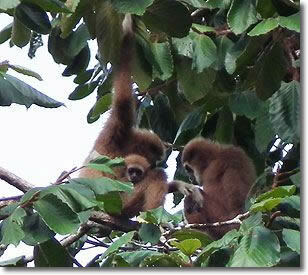 The park also shares borders with Klong Saeng Wildlife Sanctuary and some other smaller national parks. We stay in unique floating bamboo bungalows in a remote area of the massive reservoir. Hornbills are actually common. We frequently see several species. 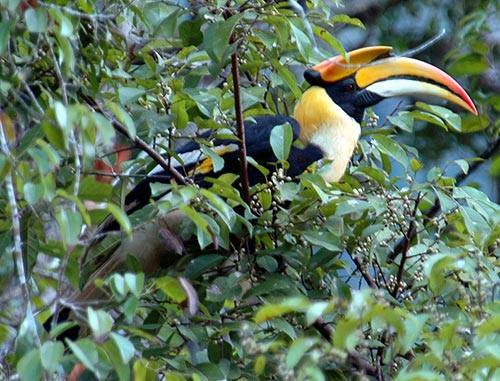 We see Great Hornbills, Bushy-crested Hornbills, Wreathed Hornbills and Helmeted Hornbills on almost every trip. White-crowned Hornbills and Plain-pouched Hornbills are sometimes seen.If you’ve never seen a hornbill, this will be a very special treat. Hornbills aren't the only birds we see. Birders can easily add a plethora of tropical birds to their life lists. A large number of kingfishers reside in the area, along with dozens upon dozens of other colorful birds. Long-tailed macaques (monkeys), pig-tail macaques, dusky langurs (monkeys), gibbons (apes), Gaur, and even wild elephants are seen on most trips. One thing is inevitable, you’ll see and/or hear monkeys! We’ve had numerous close-up wild pig sightings. Wild Asian Elephants are in the park. Check out our wild elephant image gallery. We also do some hiking. We don't go where others go as a rule. We prefer to find our own trails and we've found a lot of nice ones. Our favorite places to hike are some creeks and a unique highland swamp. However, two of the nicest hikes are also popular. We try to time it so we do not meet other travelers. We have a variety of hikes where no one else goes. The Khao Sok veiwpoint and the Nam Talu Cave hikes are two of the highlights of any visit. 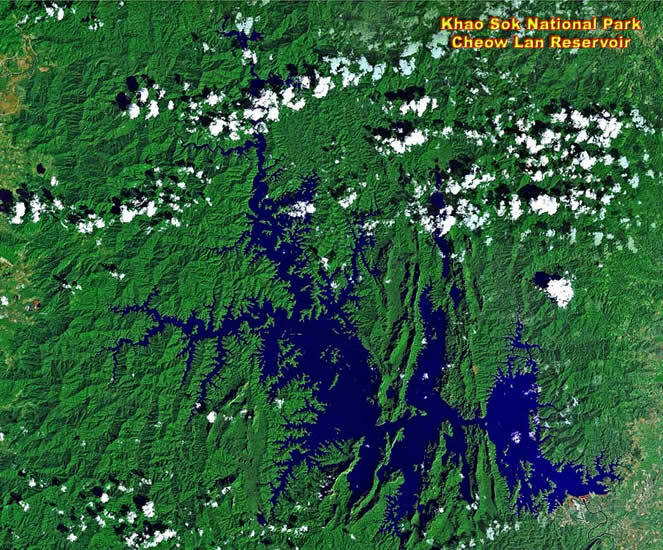 Click here to see a map of Cheow Lan Lake in Khao Sok National Park. I can't say enough about our fantastic trip to Thailand's Khao Sok National Park with PaddleAsia. It was a great experience from start to finish - well organized but flexible itinerary, with just the right combination of paddling adventures and relaxation. The scenery is absolutely spectacular - we explored miles of pristine shoreline, bordered by towering, limestone mountains and verdant tropical jungle. Thanks to Dave's expertise, we paddled to just the right places to see a wide range of creatures - primates like dusky langurs, pig-tailed macaques and white-handed gibbons, and lots of bird life, including several types of eagles, hawks, and 3 different species of hornbills. We even saw wild pigs feeding at water's edge. For complete information on kayaking in Khao Sok, including photos, rates, schedules and itineraries, please visit our sister site Paddle Asia. Mr. Sak leads most Khao Sok trips. He also runs the survival courses. Dave only goes on big group trips and school group trips, because Thai law dictates that all guides must be Thai. Mr. Sak is fluent in English and he's conversational in several others. He is certified in first aid to international standards by Emergency First Response. You're in good hands. Dave is an Emergency First Response Instructor and a certified rescue technician through the Rescue 3 International organization. View certifications. All of our professional guides are certified in CPR and First Aid. Our sister sites. Sea Kayaking Thailand is a Division of Paddle Asia.